The front 7 sets the tone for your defense and The Colt football blocking pad with arms drills your linebackers and defensive linemen into a disruptive force capable of ruining any offensive gameplan. This drill teaches pad level, leverage and block shedding at the line of scrimmage, so your front seven can control the gaps the offense needs and force the back to bounce into the arms of a waiting defender. Teach your linebackers to get thin, never exposing their numbers to the offensive line or pickup blockers. Even when they can’t make the play, they’ll force the offense into costly holding penalties. 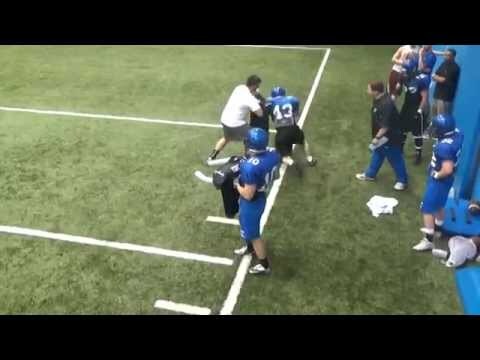 Game speed drills with The Colt football blocking pad with arms creates muscle memory which carries over into the game, ensuring a ferocious defense all season long.